The Fender Stratocaster is one of the most iconic electric guitar designs in history. Iconic guitarists such as Jimi Hendrix, Eric Clapton, Yngwie Malmsteen, and Stevie Ray Vaughan are almost always seen holding a strat. The Stratocaster has been so popular that you don’t have to look far to find one of the countless copies out there. Fender acquired the brand Squier in 1965. In 1982, Fender started using the Squier brand as a way to produce low-cost Stratocaster and Telecaster guitars. Squier became popular as a budget alternative to a ‘proper’ Fender Stratocaster. In the past, there was a clear distinction between a Fender Stratocaster and a Squier. Today, the range of guitars under both brands is far more complicated and blurred. In this review, I will explain everything you might want to know about Squier Strats, how they compare against Fender Strats and answer common questions. By the end of this review, you will know whether one of the Squier series strats is right for you. Is Squier The Same As Fender? There’s often some confusion among guitarists over what Squier is and how it compares to Fender. Is a Squier strat really a Fender? 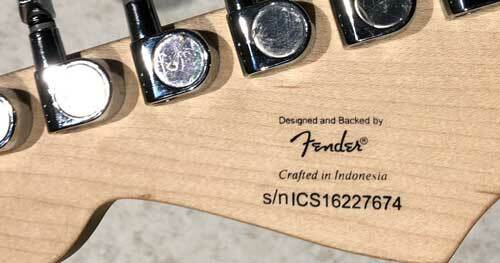 When you see “Squier by Fender” printed on the guitar’s headstock, what does that mean? While it doesn’t really matter if a Squier is really a Fender or not, it’s important to know the differences between the two brands. It’s important to look past brand names and take a look at what really matters. Squier is owned by Fender, so technically a Squier is a Fender guitar. But that is like saying the drink Fanta is the same as Coke because the Fanta brand is owned by Coca-Cola. Just because Fanta is owned by Coca-Cola, it doesn’t mean it’s the same thing as a Coke. It would be ridiculous to think they’re the same. It’s the same with Squier and Fender. Just because the Squier brand is owned by Fender, it does not mean a Squier is a Fender guitar. While a Squier strat may look the same as a Fender strat, they’re not the same in many ways. While that isn’t necessarily a bad thing, it is important to know that they’re not the same. 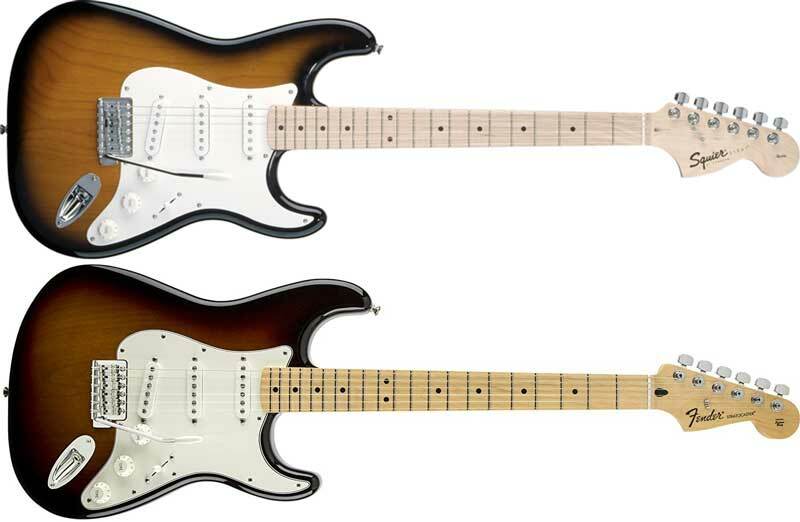 The major difference between a Squier Strat and a Fender Strat is one is made in the US or Mexico (Fender), while the other is made in Asia (Squier). This means different people and factories make the two brands’ guitars. There are different levels of quality control between countries and different standards. The other major difference used to be the quality of parts and price of the guitars. The difference between a Fender Stratocaster and a Squier used to be obvious as soon as you looked at the price tag. Today the lines are blurred. In general, Squiers cost less than Fenders and use lower quality parts. But there are some Squiers that cost more than a Fender, and some Fenders use lower quality parts than some Squiers. Squier has really improved in quality over the last decade and it’s now quite common to find a Squier that plays just as well as a Fender, if not better in some cases. Some guitarists see Squier guitars as a “licensed copy” and a way for Fender to compete against all the other Stratocaster copies you see with weird brand names. That’s mainly why you see the name Fender on a Squier’s headstock. It’s not really a Fender, but it’s more of a Fender than the countless copies out there. In the above photo, you can see how similar a Squier looks from a Fender. If you ask most guitarists which one they think will be the more expensive guitar, most people would say the Fender. But in the above example, both of these models cost exactly the same. The blurred lines between Fender and Squier make comparing the options confusing. Whether you want to think of a Squier as a Fender or not is up to you. Guitar brands are tricky and licensed versions of brand names makes things confusing. The main lesson to take away from the Squier vs Fender issue is that a brand name is a piece of marketing. Find a guitar that suits you and don’t worry about the name on the headstock. In this review, I will look at the main three types of Squier Strats you can buy, how they compare against each other, and which one might be right for you. In the past, buying a Squier was straightforward. They were seen as a lower-cost alternative to a Fender Stratocaster and all you had to do was pick a color you liked. There have been plenty of other models over the years by Squier, such as the Squier Standard series and the Squier Classic Vibe series. 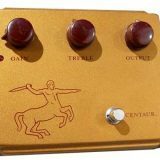 In this review, I will focus on the above three series as they’re the most common series I’ve seen guitarists use. Most guitarists who are interested in a Squier Stratocaster will find one that suits their needs in one of these series. The Squier Bullet is the cheapest series available across the Squier and Fender brands. I’ve had many students over the years come to me with a Squier Bullet in their hands. They were designed for beginners as a first guitar. The Bullet is commonly sold in a starter kit at an incredibly low price. This is often a good choice for parents thinking about buying a first guitar for their child. While the general advice is to buy the best quality guitar you can afford, this is often a better choice for parents who aren’t sure whether their child will stick with guitar or not. Buying a Squier Bullet and a small practice amp is a small risk for parents compared to buying an expensive guitar that may not be used in six months’ time. The big difference between the Bullet and the Affinity is the quality of the materials used. The Bullet uses a Basswood body and ceramic pickups. 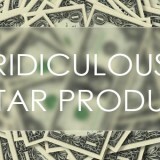 These materials help reduce the cost of producing the guitar and keep the price down. The tremolo on the Bullet is more for looks than anything else. Low price guitars like the Bullet struggle with tuning stability and one press of the tremolo system is often enough to put the entire guitar out of tune. A beginner isn’t likely to be using a tremolo, so this isn’t much of a concern for somebody just starting out. Check out the current price and options for the Squier Bullet Stratocaster here. While the above points may sound negative, it’s important to remember that some people don’t need a high-quality guitar. A 7-year-old who is taking guitar lessons for the first time doesn’t need a $500+ guitar. He just needs something with six strings that works. If you’re on a tight budget and are interested in learning guitar, the Squier Bullet might be worth checking out. If you have some experience learning guitar, you may prefer spending the extra money for a Squier Affinity. The Squier Affinity Stratocaster is incredibly popular due to its low price and good quality build. I’ve seen a lot of Affinity Strats over the years and while I noticed inconsistent build quality in Bullets, the Affinity Strats were more consistent. Compared to the Squier Bullet, the Affinity uses an Alder body and higher quality pickups. 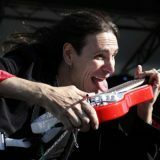 When it comes to electric guitars, the quality of the pickups plays the biggest part in the quality of the guitar’s tone. When the Affinity is compared against more expensive guitars it may not sound that impressive, but for the price, it’s a solid choice. Electric guitars in this price range tend to have fairly cheap pickups, so they’re normally the first thing a guitarist will upgrade. If you’re a beginner starting to get serious about guitar, then a Squier Affinity may be a good choice. If at some point in the future you start to feel the pickups are holding you back, it’s quite easy to upgrade them (read this guide on upgrading pickups). The above guitar has a single coil in the neck position, single coil in the middle position and a humbucker in the bridge position. The advantage of this type of configuration is you get a wider range of tones compared to an all-single-coil-guitar. The first guitar I started learning on was in this H-S-S (shorthand for Humbucker, Single-coil, Single-coil) configuration. I highly recommend it for guitarists who are interested in a range of different music styles. The single coils allow you to access the nice bluesy tones that the Stratocaster is famous for. The humbucker in the bridge position also lets you access tighter and punchier tones for rhythm parts. I found it incredibly valuable to have when I started getting into metal. If you’re interested in the heavier or harder styles of music that mainly use humbuckers, make sure you read about the Squier Contemporary series below as that series may be a better choice for you. Check out the Squier Affinity here for the current price and different options. If you’re after a Strat and want a decent quality guitar to get you started, the Affinity series is worth considering. They’re not just for beginners as I have seen intermediate and advanced guitarists make great use of them. Depending on the styles of music you listen to and your personal preferences, you may not like the pickup configuration in a traditional Stratocaster. The Squier Contemporary series gives guitarists a way of getting the Strat style with different pickup configurations. Traditional Stratocasters come with three single coil pickups. 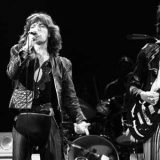 This is great for many different styles of music but not all styles. There aren’t many metal or hard rock guitarists who use traditional single-coil pickups. The problem with traditional single coil pickups is that they produce a lot of noise. Crank the gain up on a guitar with single coil pickups and you’ll hear a wash of hum and buzz. Not good if you want a punchy rhythm section or tight riffing. 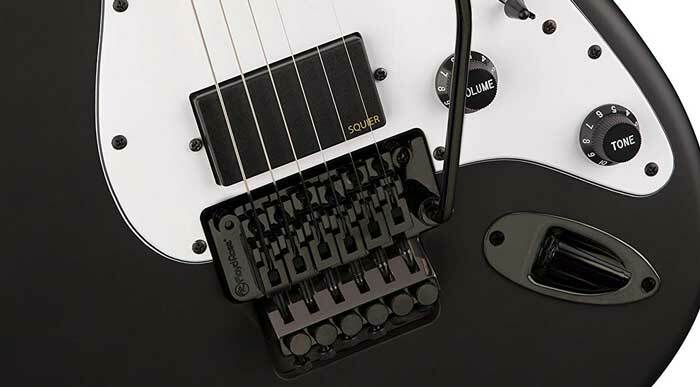 The above Squier uses two active humbuckers. Active pickups are very different than passive pickups and produce very different tones. For a guitarist wanting a high-output signal with a punchy tone, this may be the best choice out of all the other Squier guitars. The above Squier also uses a licensed Floyd Rose bridge and locking nut, which is a big change from the traditional tremolo on Strats. This style bridge allows a guitarist to actually use the tremolo arm without fear of the guitar instantly going out of tune. Floyd Rose bridges are also a bit more complicated than a standard tremolo. So if you’re a beginner looking for a first guitar, you might want to avoid one. While they offer great benefits such as tuning stability and freedom to use the tremolo arm in aggressive ways, they can be difficult to set up correctly. There are different bridge options available if you don’t think you’ll benefit from a Floyd Rose bridge. If you compare this guitar with the other models shown earlier, it should be obvious how different the Contemporary series is. While the body shape is still distinctly a Stratocaster, the features on this guitar make it very different to play and sound. The Squier Contemporary is a strange series of guitars. It tries to keep the classic Strat look, but with pickup and bridge configurations that don’t tend to follow typical Strat based music. Check out the price and different options across the Squier Contemporary Series here. If you like the look and feel of a Strat but want to play harder/heavier music, this series may suit you. I’ve only had one student buy a Squier Contemporary because most guitarists who want a guitar that suits harder styles of music tend to look elsewhere than what Fender/Squier offer. If you’re considering this type of guitar, don’t overlook what brands like Ibanez or Jackson can offer for the same price. The above information should give you a good idea on which type of Squier might be right for you. Check out the below questions and answers for more advice on Squier guitars and how you can get the most out of one. Where are Squier by Fender guitars made? Over the years Squier guitars have been made in many different countries such as Japan, Korea, Mexico, India, China, Indonesia, and the US. Today, Squier guitars are made in Asian countries such as China, Korea, and Indonesia. What is the best Squier guitar from best to worst? The best Squier guitar is the one that fits your needs as a guitarist and your budget. For some guitarists, that will be a Bullet. For other guitarists, it might be an Affinity or a Contemporary. If you wanted to rank the Squier guitars based on quality from best to worst, the order might be: Contemporary, Affinity, then Bullet. The price of the guitars is a good indicator of the quality. Are Fender and Squier parts interchangeable? Most parts will be interchangeable between a Fender and a Squier. Pickups and electronics are generally easily interchangeable between electric guitars. This means if you want to upgrade your Squier’s pickups to a higher-end Fender pickup (such as their excellent noiseless pickups), it’s pretty straightforward. When it comes to guitar necks, it’s hard to say whether they will be interchangeable. There are small differences in necks across Squier and Fender guitars which may or may not allow you to interchange them. The width of the neck pocket, the shape of the neck joint, and a few other factors make it unlikely you will find a neck with a perfect fit. While it is possible to perfectly fit a Fender neck into a Squier body, the chances are pretty low. How to make a Squier Strat sound better? There are many things you can do to make your Squier Strat sound better. The most effective way is to upgrade the pickups as they have the biggest impact on your tone. The lower the price your guitar was, the cheaper the pickups will be. Changing those cheap pickups with higher quality pickups will massively improve your tone. A good example of a set of pickups that would be a big improvement in a Squier would be to get a set of Fender’s Noiseless Pickups. These pickups keep the unique characterists of single-coil pickups while removing hum and noise. If you find your pickups noisy and hum too much, they’re worth considering. Find out how to upgrade your guitar’s pickups in this guide with step-by-step instructions and photos of every step.